SEOUL, April 9 (Yonhap) — The European Commission warned Tuesday that it will seek to launch an expert panel to review South Korea’s compliance with the free trade pact it signed with the European Union if it fails to ratify key international labor conventions. EU Trade Commissioner Cecilia Malmstrom delivered the message to South Korean Labor Minister Lee Jae-kap during a meeting in Seoul earlier in the day, according to the Ministry of Employment and Labor. An EU delegation led by Malmstrom is in Seoul for consultations with South Korean officials regarding Seoul’s long-pending ratification of four fundamental International Labor Organization (ILO) provisions. 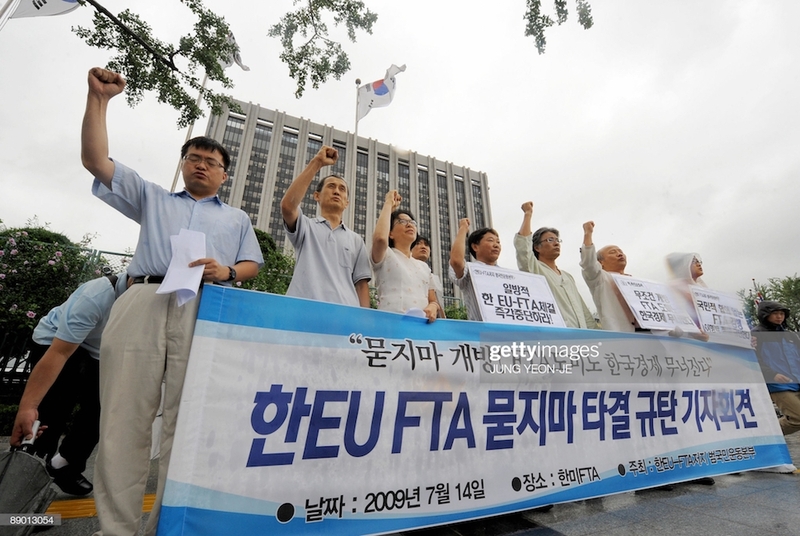 The EU has demanded Seoul approve the provisions as agreed in their free trade agreement (FTA) implemented in 2011. Malmstrom said in the meeting that ratifying the conventions could strengthen the competitiveness of South Korean businesses, contrary to industry worries, and called for the government’s stepped-up efforts to resolve the matter, the ministry quoted her as saying. Lee stressed that Korea is doing its utmost to fulfill its agreement, inasmuch as ratification has been one of the key national policy agendas pushed by the office of President Moon Jae-in, the ministry added. South Korea joined the United Nations agency on labor in 1991 but hasn’t ratified four key conventions. They generally concern the strengthening of basic labor rights, such as guaranteeing the rights of individuals to organize a group to represent themselves and to take action to defend their labor rights. But current South Korean labor law forbids certain professions, such as public officials, and dismissed employees from joining a labor union. It also mandates that the establishment of a labor union requires approval from the relevant government office. The EU had asked Korea to produce an outcome on ratification by early April or it would consider having an expert panel determine whether the delay in ratification constitutes a violation of the Korea-EU FTA. Failing to ratify the ILO provisions does not necessarily lead to additional tariffs or penalties, but the Korean government is worried that a delayed process could act as a barrier to expanding free trade between the two sides and undermine Korea’s reputation in international trade.